The Consumer Technology Association (CTA) returns to SXSW this year to host the Innovation Policy Day on Tuesday, March 14. This day-long summit will bring together a diverse group of panelists to discuss government policies that impact the emerging and disruptive technologies improving the way we live and work. Panel topics range from the outlook of tech under President Trump’s administration to the rise of self-driving cars. The event will take place at Old School Bar and Grill from 10:00am, until the last panel of the day starting at 3:30pm. Breakfast and lunch will be served. For more information, visit the Innovation Policy Day website. 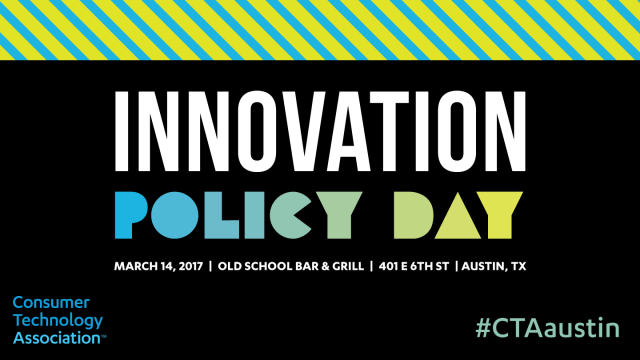 In addition to the Innovation Policy Day, CTA executives will speak on several panels throughout SXSW. These will cover a variety of topics, including how tech companies can give back, unlocking technology for people with disabilities, defining VR, and strategies for tech advocates working with Trump. For more information about the Consumer Technology Association’s presence at SXSW, visit their website.